1913 Bath House Inventory, p. 129, no. 645, in the safe. 1914 Wernher Inventory, p. 36, no. 189. The magnificent enamelled chalice made for the Count of Majorca, now in the Louvre, Paris, and attributed to a Barcelona workshop, circa 1360, shares several characteristics with the present example (N. de Dalmases and A. J. Pitarch, Historia de L'art Catals, III, L'art Gotic, S.XIV-XV, Barcelona, p. 283; and G. Taylor, Continental Gold and Silver, London, 1967, p. 47, pl. 24). The mounting of the tapering basse taille enamel panels in the base, the architectural elements in the stem, the form of the knop and calyx are all common to both, although the bowl of the Louvre example is somewhat narrower and also enamelled. The similarities are such as to suggest that the two chalices may have originated in the same workshop. 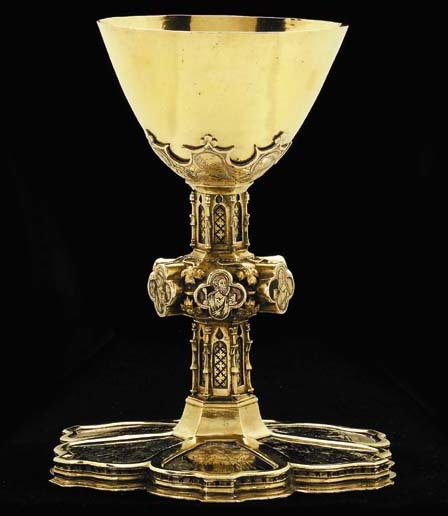 The translucent enamels on this important chalice are also similar to those found on a silver-gilt processional cross in the collection of the Victoria and Albert Museum, London. This is struck with the town mark of Tarragona, 70 kilometres to the south of Barcelona, in Catalonia and dates from the last quarter of the fourteenth century (C. Oman, The Golden Age of Hispanic Silver, London, 1968, no. 2, pls. 4 and 5). The sleeping guard illustrated in the lower right of the scene of the risen Christ on the processional cross is very similar to the figure on the parallel scene on this chalice (ibid. fig. 10). We are grateful to Dr. Rafael Munoa of the Royal Academy of History and Dr. Cruz Valdovinos, Doctor of Art History, Complutense University, Madrid, for the reference to the Louvre chalice and for their comments on all the Spanish pieces in the Wernher Collection.